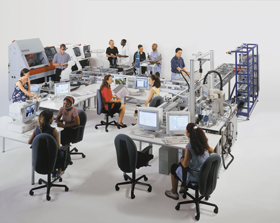 Festo is a global manufacturer of factory automation components, controls and systems. We work daily with a wide array of manufacturers in many different industries including automotive, bio-medical, semiconductors, pharmaceutical, food processing, packaging and chemical. We have created a broad range of training hardware and simulation software to support your people’s workplace development. We have a comprehensive range of Open Courses. Find out more about these topics by going to the pages below. Our technical courses can either run at our training facilities in Northampton or at your own premises. If you need to have a course tailored or created specifically for your company do visit Tailored and bespoke training & consulting or Contact Us to find out more. The role of any training is ultimately to change habits in the workplace through the application of new skills and knowledge. To help you assess which training is right for you and your team we have free to use Knowledge Checkers on our technical topics. Training will become embedded when people put into practice what they’ve learnt. Festo Training & Consulting can put together a follow-up programme to ensure that new knowledge is applied. To find out about this contact us.